A funny routine that has everyone giggling and laughing but especially the children and involves the whole family. The routine includes all the traditional features that you expect, it builds in a clear message to the children that they must NEVER play with matches or match boxes and of course it is magical. During the routine you see a matchbox open by itself and you have a wonderful opportunity to take a picture of your son wearing my special birthday cake hat. This is a fresh approach to the traditional routine that had been done so many times it has become a bit stale. My routine is fun, novel, different and magical but does include the traditionally important features you would expect. 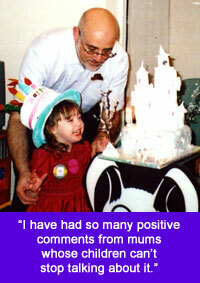 To go back to the story of your son’s party with Mr Mysto simply click the back button on your browser. To enquire about me attending your son’s party simply call 0800-0188118 (best from a land line) or 01737-350586 (best from a mobile). To enquire without calling use Priority Contact Information.